Bank of Canada governor Stephen Poloz says the eventual destination range for his key interest rate target — estimated by his team at between 2.5 and 3.5 per cent — is in fact "sufficiently uncertain" and could glide up or down. "Everything in economics has a wider range around it than we realize, but still it's sufficiently uncertain and ... it's, in principle, movable," Poloz said in response to a reporter's question about the uncertainty around the estimated range following his speech to the Canada-UK Chamber of Commerce in London. The Bank of Canada raises the interest rate as a way to keep inflation from climbing too high. It describes its neutral policy rate as the sweet spot where the economy can continue to grow, on an ongoing basis, without knocking inflation too far from its ideal target of two per cent. The eventual destination of Poloz's rate-hiking trajectory could have implications for households, particularly those that have piled on large amounts of debt while rates have remained low. Many Canadians have racked up debt over the last decade because the central bank, like so many in the world, responded to the 2007-08 financial crisis by keeping interest rates very low. It was part of an international effort to stimulate economic growth. Poloz said Monday the Bank of Canada's neutral range matches the estimate for the United States. He noted there are different ways to calculate the range and there's uncertainty around all the parameters that feed into it. "All we know is that as we get closer to it — whatever it is — we'll begin to see signs that we're no longer stimulating demand and, in fact, we know if we cross into the neutral zone we may see signs that we're beginning to constrain demand," he said. Finding the balance will include taking into account the added sensitivity and risks of higher debt loads, Poloz added. Poloz noted, during a question-and-answer period that followed his speech, that neutral is "not a precise destination, it's more like a neighbourhood." A big question has centred around how quickly the rate will rise. 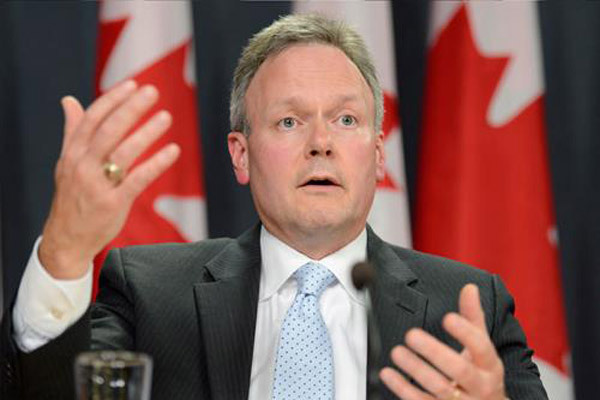 Poloz recently signalled hikes could arrive sooner than previously expected. The bank's next rate decision will be announced Dec. 5. Poloz reiterated Monday the bank will decide on the appropriate pace of the increases based on how well the economy adapts to higher interest rates established by earlier hikes, given the high levels of household debt. He also said the central bank will pay close attention to new developments in international trade. "It means that every meeting is in play (for a rate hike) depending what the data have been showing us," he told the audience. "If the data are surprisingly good then we're going to be leaning that way because it means that our story is progressing faster than we thought. If the data gives us a bit of a pause then, of course, it will mean that the data are progressing a little less quickly than we had built in." In his speech, Poloz said the low-rate era has helped the world economy make considerable progress in shaking off the effects of the financial crisis. To the point, he argued, that the rock-bottom rates are no longer necessary. "After a decade of extraordinary effort by central banks to flood markets with liquidity, the global economy has reached the stage where stimulus can be steadily withdrawn," Poloz said.